This article is a short summary of Super Mario 3D World. Super Mario 3D World is the Wii U follow-up game to Super Mario 3D Land and the sixth 3D platforming game in the Super Mario series. Released in November 2013 worldwide, the game is the first 3D Super Mario game to support cooperative multiplayer, a feature that was attempted since Super Mario 64. Captain Toad: Treasure Tracker, a spin-off game based upon the "Captain Toad" stages in this game, was released in 2014. Fun For All Levels! Helper items will appear for players that get stuck. Freely roam the world map and each sprawling stage alone or team up with friends to find hidden stars while competing to take the crown for most coins and points found. Tap the Wii U™ GamePad controller's touch screen to freeze enemies and reveal invisible secrets. Or, use the GamePad for off-TV play while tilting it to spot hidden nooks and crannies with the movable camera. Share tales of your journey online via Miiverse™ and make your posts pop with collectable stamps found in courses and Sprixie Houses. Challenge the ghost Mii™ characters of other online players and match their pace to score helpful gifts. All this and more makes Mario's world deeper than ever. Jump on in! In the Mushroom Kingdom, the Mario Bros., Princess Peach and Toad come across a bent clear pipe, which Mario and Luigi immediately fix, causing a number of items to pour out of the pipe followed by one of the Sprixie Princesses. The fairy tells the group that Bowser has captured her fellow Sprixie Princesses before Bowser appears out of the pipe and captures her as well, retreating back into the pipe. The group follow him back down the pipe and are taken to the Sprixie Kingdom, which they must save by defeating Bowser and freeing the captive Sprixie Princesses. Super Mario 3D World uses a similar gameplay structure to Super Mario 3D Land. Players travel through linear yet 3D stages to reach the Goal Pole at the end within the time limit. The game supports a cooperative and competitive multiplayer system, in which up to four players can play simultaneously as either Mario, Princess Peach, Luigi, and Toad, each of whom have their own unique gameplay traits and abilities, while the multiplayer system is similar in structure to New Super Mario Bros. Wii, allowing players to enter a bubble to avoid harm, though like in New Super Mario Bros. 2 all players share the same life and coin counters. Other elements from 3D Land such as its power-ups also return, though several new power-ups also appear, the primary new power-up being the Super Bell, which turns Mario into Cat Mario and allows him to climb up walls and scratch and pounce to attack. As a throwback to previous 3D Mario games, this game features three Green Stars in each stage, which are used in a similar way to the Star Coins in the New Super Mario Bros. series, allowing players to unlock certain stages by collecting a certain amount. Most stages also feature a collectible stamp, which allows them to add pre-drawn designs when making a post to Miiverse. In every other world, the player will find stages in which player 1 controls Captain Toad in what is known as "The Adventures of Captain Toad", navigating smaller, more compact and puzzle-oriented stages to collect all five Green Stars in the stage. In worlds where Captain Toad is not found there is instead a Mystery House, an extension of the Mystery Box concept from the previous game in which players face a series of timed challenges to collect Green Stars. Nintendo originally announced that a new 3D Super Mario game was in development in the January 2013 Nintendo Direct. Super Mario 3D World would later be shown off for the first time in the Nintendo Direct @ E3 2013. According to Koichi Hayashida, Nintendo EAD Tokyo had thought about creating a follow-up to Super Mario 3D Land since development for that game had begun. Upon release, Super Mario 3D World received critical acclaim, with many critics giving the game high if not perfect scores. Most reviewers praised the multiplayer gameplay and multiple playable characters, the new cat transformation, as well as the graphics and soundtrack, though some took issue with the game's camera when playing with multiple players. Some critics also noted that the game does little to take advantage of Wii U-specific features. 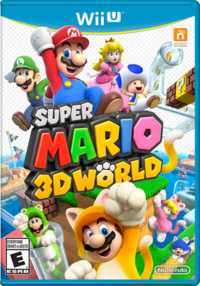 Jose Otero of IGN gave the game a 9.6 out of 10, stating that, "Super Mario 3D World is marvelous, and its constant variety and fantastic light-hearted co-op play proves that Nintendo still knows exactly how to tweak the Mario formula in fun ways." Destructoid's Chris Carter gave it a 10 out of 10, calling it, "one of the greatest Mario games ever made," and stating that "Super Mario 3D World had achieved a level of platforming design that's close to perfection, and there was almost never a moment where I didn't have a smile on my face." The game was also given an Editor's Choice Award. Bryan Vore of Game Informer rated Super Mario 3D World a 9.25 out of 10, praising the game's multiple characters as a "refreshing change of the formula" and that it "teases Nintendo’s willingness to tweak tradition throughout the rest of the game," overall calling it "an excellent entry in the series." Eurogamer's Christian Donlan also gave the game a 10 out of 10, stating it as being "one of the strangest Mario games in years - or at least one of the most random in its influences and its moment-to-moment indulgences. And that's a very, very good thing." Before release, the game was nominated for several E3 awards. The game was a runner-up for many Best Wii U Game awards, including IGN, GameTrailers, and Destructoid, while the game won Best Wii U Game from Electronic Gaming Monthly. IGN and Destructoid also nominated the game for Best Platformer, and the former also nominated it as the Best Overall Game. After its release, Super Mario 3D World was awarded Game of the Year from publications such as Eurogamer and Digital Spy, and was nominated by several others, including IGN, GameSpot, and GameTrailers The game was also nominated for Game of the Year and other categories for the 14th Annual Game Developers Choice Awards, the British Academy Games Awards, the 32nd Golden Joystick Awards, the VGX, and won Best Multiplayer Game at the SXSW Gaming Awards. Super Mario 3D World was also nominated for and won several "Best Wii U Game" and "Best Nintendo Game" awards. IGN also awarded the game Best Overall Platformer Game, and it was nominated for Best Overall Multiplayer Game, Best Overall Music. As of September 30, 2016, Super Mario 3D World has sold over 5.19 million copies worldwide, making it the third best-selling Wii U title overall. EU: March 11, 2016 A re-release of the game under the Nintendo Selects line. ↑ Wii U Direct - Nintendo Games 1.23.2013. Nintendo (YouTube; January 23, 2013). Retrieved January 7, 2017. ↑ Nintendo Direct@E3 2013. Nintendo (YouTube; June 11, 2013). Retrieved January 7, 2017. ↑ Iwata Asks : Super Mario 3D World : "Let's Put Everything In!". Nintendo. Retrieved January 7, 2017. ↑ Famitsu Review Scores: Issue 1302. Gematsu (November 12, 2013). Retrieved January 7, 2017. ↑ Super Mario 3D World review. Eurogamer (November 19, 2013). Retrieved January 7, 2017. ↑ 6.0 6.1 6.2 IGN's Best of E3 2013 Awards. IGN (June 11, 2013). Retrieved January 7, 2017. ↑ Best of E3 2013 Awards - Best WiiU Game. GameTrailers (YouTube; June 24, 2013). Retrieved January 7, 2017. ↑ 8.0 8.1 Destructoid's Best of E3 2013 winners!. Destructoid (June 18, 2013). Retrieved January 7, 2017. ↑ EGM Presents: The Best of E3 2013. EGMNOW (June 15, 2013). Retrieved January 7, 2017. ↑ Eurogamer's Game of the Year 2013. Eurogamer (December 30, 2013). Retrieved January 7, 2017. ↑ Why Super Mario 3D World is Digital Spy's game of the year. Digital Spy (December 21, 2013). Retrieved January 7, 2017. ↑ Best Overall Game - IGN's Best of 2013. IGN. Retrieved January 7, 2017. ↑ Overall Game of the Year 2013 Winner. GameSpot. Retrieved January 7, 2017. ↑ Game of the Year Awards 2013 - Game of the Year. GameTrailers (YouTube; July 19, 2016). Retrieved January 7, 2017. ↑ Game Developers Choice Awards. Retrieved January 7, 2017. ↑ Games in 2014. BAFTA. Retrieved January 7, 2017. ↑ Spike VGX 2013 award nominees announced. Polygon (November 18, 2013). Retrieved January 7, 2017. ↑ Best Wii U Game - IGN's Best of 2013. IGN. Retrieved January 7, 2017. ↑ Polygon's Games of the Year 2013 #8: Super Mario 3D World. Polygon (January 13, 2014). Retrieved January 7, 2017. ↑ Best Overall Platformer Game - IGN's Best of 2013. IGN. Retrieved January 7, 2017. ↑ Best Overall Multiplayer Game - IGN's Best of 2013. IGN. Retrieved January 7, 2017. ↑ Best Overall Music - IGN's Best of 2013. IGN. Retrieved January 7, 2017. ↑ Top Selling Software Sales Units. Nintendo. Retrieved January 7, 2017. This page was last edited on 14 November 2018, at 22:17.